ARupLife.com received product to facilitate this review. Post may contain affiliate links. I've mentioned to you all before that I wear a full face of make-up just about every day. It is rare to see me with minimal or no make-up. Even when I wear minimal I still curl my lashes! My lashes are medium to long in length and stick straight out. If I don't curl them then even with mascara you don't see them. So I use a curler and then apply two good coats of mascara. This makes beautiful long lashes for me. I received Whiplash Eyelash Curler by Crave Naturals for review. This eyelash curler is unique because it has a little hook on the bottom to keep it closed when not in use. I like that feature - it is pretty handy! It also has a hot pink eye pad and handle. I love hot pink! I really like the size of the part that actually curls your lashes. Often times I can't get the curler close enough to my eyelid to do what it is supposed to do. This one fit my eye size (perhaps smallish?) very well. Overall it worked well and was a nice addition to my make-up routine. I also want to give a shout out to the adorable packaging. Love that comic book theme! 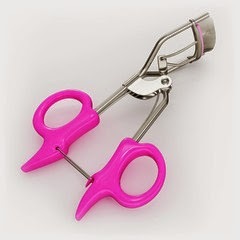 You can purchase your Whiplash Eyelash Curler either directly from them or online at Amazon.